Now that the girls have finished moving into their separate berths and all the toy sorting and memory foam bedding mischief has been managed, they set their eyes on custom shelf desk thingies. I grew up helping my dad build our house and assisting in the shop with furniture creations, so I was game to tackle this project. I’m certainly not as good as my baby brothers and their mad finishing skills, but I did okay for only having one hand saw, a drill, and a few basic measuring tools. The real challenge was the fact that the lumber store was four miles away. Not wanting to spend money on a cab, I decided to try and bring it all back on my folding bike. 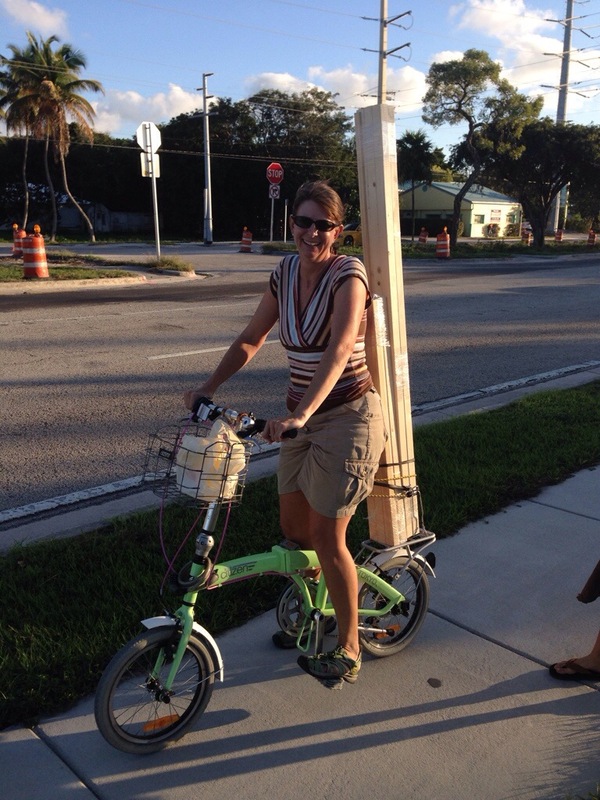 I know I won crazy lady points, but I got the bike, wood, and myself home one piece! 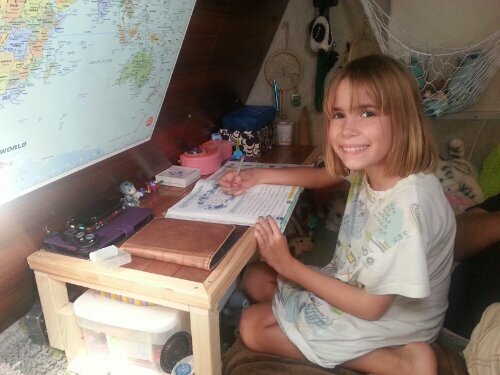 Madi and I still need to make the eight mile round trip for her shelf top (she gets to pick out the kind of wood), but Peyton’s desk is finished using left-over teak flooring. Other than staining and varnishing the frame and edging (which is her responsibility), I’d say it’s pretty functional. It was all her design too! Way to go my lady carpenters and a great improvement over the $10 plastic shelves they had before! We have some carpentry work to be done up here. What do you charge? We charge room and board…but require sunshine, not that crazy stiff you have now! Stuff 🙂 although it is so cold it makes you stiff! Go Lady Carpenters!! Miss you all!! OH MY GOSH!!! You guys are sooo awesome!! Robin,, I am inspired by you!! Way to go TEAM BECK!! !